Wearing Helmets With Glasses | welcome to the janniverse. As I’ve mentioned before, I’m also a big believer in wearing proper gear when I’m on any bike. To my mind, proper gear always includes a full-face helmet. You may feel differently, and that’s your choice. However, this piece is meant to address some unique concerns that glasses-wearers who choose full-face helmets will encounter. If this doesn’t apply to you or someone you know, feel free to skip this entry. That photo features my current favorite helmet that I own: the Vemar CiQuiKi. It’s marketed as a scooter helmet, probably because of its unusual brand-new-you’re-retro design. It’s also considered modular, because that chin bar is removable, instantly transforming it into a three-quarter lid. Although it looks cool as a three-quarter lid, I’d never feel good about wearing it that way — but it’s worth noting if you’re considering it. Why do I like this lid so much? 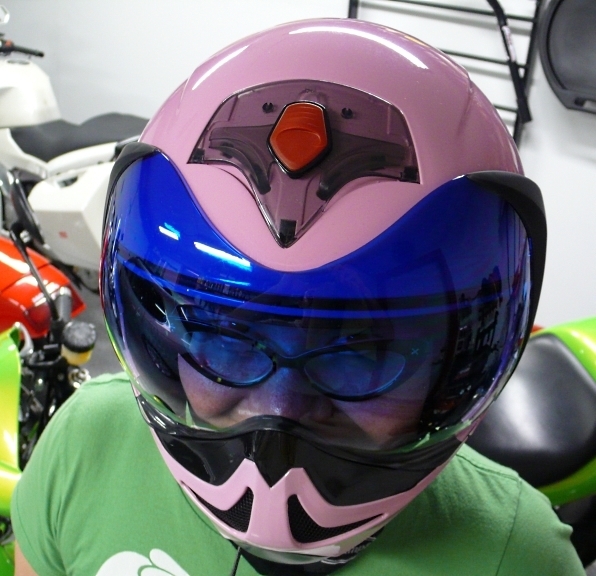 That explanation goes hand-in-hand with talking about helmet fitment and wearing glasses. Different helmet manufacturers offer helmets with different interior shapes. That’s right. Fitting helmets is just as complicated as fitting shoes. These are roughly the shapes involved. Makes sense, right? All our heads are slightly different sizes and shapes. What will fit you best? That’s the more complicated part. Just like shoes, jeans, or any other article of clothing, a size M isn’t going to be exactly the same across all manufacturers, or even all manufacturers offering a lid tailored to the same head shape. In other words, the best way to figure out what fits you is to go to a few different shops and try a bunch of lids on, ideally across a few different manufacturers. Even trying on different models by the same manufacturer can help guide you. This MSF guide to motorcycle helmets offers more detailed and helpful information about making good helmet choices. This Motorcyclist magazine piece offers a short, concise guide to the rules of good general helmet fitment as well. Basically, there’s a lot more to helmets than simply finding something with paint or graphics that you like. Worry about good fitment first. Then worry about aesthetics. It seems obvious, but rule one for wearing glasses with full-face helmets is this: never, ever try to put your lid on or take it off while your glasses are on your face. Everyone I know who wears glasses has accidentally done one of these things at least once, which is why I mention it. You’ll cause yourself a world of pain, and possibly even damage your glasses. Take your glasses off. Then flip the helmet in question upside down and grab it by the straps. Pull the straps apart as close to the helmet as possible. Flip it right side up and pull it down over your head. (If you have long hair, you’ll probably want to tie it back with a soft elastic that doesn’t create too much bulk. Loose hair can go where you don’t want it to in your helmet, and a bulky elastic can cause uncomfortable pressure points under your lid.) Secure the chin strap so that it’s firmly in place. Can you easily slide your glasses into the correct place on your face? Does the combination of that helmet and the earpieces on your glasses create pain in the tops of your ears, or make the ends of the earpieces dig uncomfortably into your skull? You need a different helmet if that’s the case. If the helmet has an internal sun visor that flips down, try flipping it down with your glasses on. See whether it clears your glasses. Also, see where the bottom of the internal sun visor stops in relation to your line of vision. If you’re in a shop that sells bikes as well as gear, ask if you can sit on a bike with a similar riding position to your normal bike. Then position yourself like you normally do when you’re riding and see if you like how everything looks through that lid. Visibility is important for anyone purchasing a helmet, but you have slightly more to worry about when you wear glasses. Wind noise. It’s more than just an annoyance; it can permanently damage your hearing. You want a helmet that’s reasonably quiet — or you want to start wearing earplugs. Just to be safe, you may want to start wearing earplugs anyway. That’s another matter of personal preference, but I personally don’t like ones that block out too much sound — because hearing what’s going on around you is an essential part of riding. I swim, and I don’t like wearing the wonderful beeswax earplugs I wear for swimming on my bike because they’re too quiet. My Vemar CiQuiKi is pretty noisy. It has great visibility, the flip-down sun visor is great, and it fits me better than any other helmet I’ve tried so far. Even better, it doesn’t fog up at all — even with the visor completely closed. Because everything else about it is so perfect for me, I compromise and wear earplugs. You may feel differently. You may choose a really quiet lid, which is understandable. Be aware that quieter lids usually have a lot more material down around the neck and chin area. If you’re uncomfortable with that, you may have to consider a different lid option. Also, while most manufacturers do try to combat visor fogging, they also have varying degrees of success. By choosing a lid that blocks more wind noise, you’re also increasing the chances that your visor or glasses may fog — unless the venting in that lid is superb. If air isn’t moving through the helmet, your warm, moist breath isn’t escaping it, either. Check vents in the lid, walk around, and breathe. You won’t get the full picture until you actually ride at your normal speeds with the lid on, but these steps can help.